Marc Bouchkov, 22, of Belgium, first prize of $30,000 CAD, and a "Sartory" model bow by Sandrine Raffin, valued at $3,700 CAD. You can listen to performances from both nights of finals on the CBC website. A Gala Performance will take place Friday at 7:30 p.m. ET, featuring the winners playing with the Orchestre symphonique de Montréal and guest conductor Maxim Vengerov. Winners of the special awards will be announced at the official awards ceremony, preceding the gala concert. Here are a few highlights Wednesday's performances, as well as some thoughts to follow. 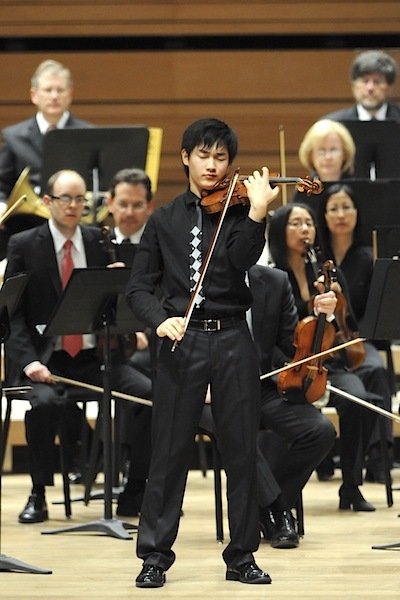 Wednesday's performances featured Zeyu Victor Li; Fédor Roudine, 20, of France; and Stephen Waarts. Zeyu Victor Li played the Tchaikovsky Concerto with tidy technique, and a nice buoyant quality to his sound. He took some very fast turns with the tempo, which is the soloist's prerogative; yet, one must be aware of how fast a large organism such an orchestra can respond, even under the best circumstances. Music takes place in real time and requires give-and-take -- not-together is not-together, whatever one's ideals. That said, this was a very fine performance, with uncomplicated sound, good projection and great technique in the cadenza. In a concerto that can be an avalanche of notes, every note was clear, even in the fastest and most technical passages. The Tchaikovsky concerto remains that infamous piece whose dedicatee pronounced it "unplayable," and on Wednesday, Fédor Roudine didn't quite have the kind of control over intonation and consistency of tone quality that puts an audience at ease. He does have a nice deep sound and some incredible chops, taking the third movement at quite a fast clip. Stephen Waarts had a beautiful grace in his playing from the first note of the Brahms Concerto -- and then he warmed up and got even better! 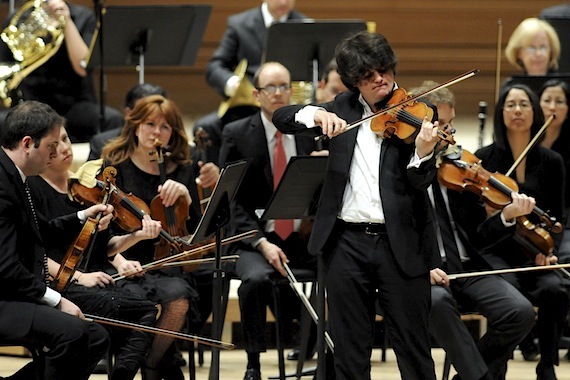 His impeccable intonation soothed the soul, and his concept of the piece was a cohesive whole -- he made it look easy. I stopped worrying, relaxed and enjoyed the beauty that is Brahms: the soaring melodies, the quirky rhythms that pop out of a cluster of notes well-played, the warmth of emotion. FINAL THOUGHTS + scroll down for COMPETITION ART! I will confess to you a certain kind of wariness, when I learned that I'd be listening to four Tchaik concertos and two Brahms during this final round of the Montreal competition, but I found all the performances so very individual. Isn't that the complaint, that high-level music schools stamp out musicians who all play the same? That there's nothing new left to do with the classics? It's not a legitimate complaint. I saw very distinct personalities and enjoyed their musical revelations. 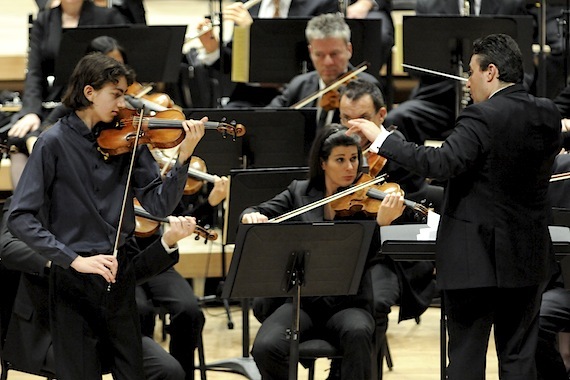 Hats off to Maxim Vengerov, who had the task of conducting the Tchaikovsky four different times, with four different sets of tempi, four different personalities and all the possible pitfalls that come with accompanying pre-professional soloists. He impressed me as a solid and steady leader, displaying an attitude of support toward each soloist. For me, Stephen Waarts was a very close second in this competition, with his mature and refined Brahms, and I fully expect to see him winning a major competition in the next few years. That said, Bouchkov seems so clearly ready for the concert stage; he has that special kind of charisma and awareness of both orchestra and audience that draws a listener in, makes one want more. I enjoyed listening to all six of these fine young musicians and only regret I was not here to hear the other rounds! Fortunately we can all listen to them, and here is the website for that. I love that music inspires people in different ways. It inspires some people simply to look at the world in different way, but it can also fan our creative urges, inspiring some to make more music, or to write. Last night inspired my friend, Los Angeles artist Lark Larisa Pilinsky, to draw! 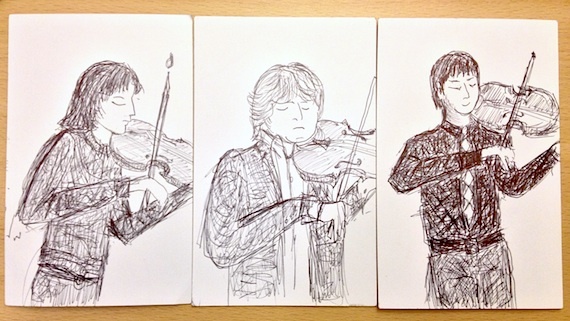 Here are her sketches of the evening's three performers; I feel like she really captured something of their playing. Left to right: Stephen Waarts, Fédor Roudine and Zeyu Victor Li. Thanks for your great reporting and for sharing your first hand experience of this great competition! It is much appreciated! Thanks for helping me find my way around the lovely city of Montreal, Christian! What an honor to be here, with so many talented young musicians and also such a very well-organized event as is the Montreal International Musical Competition.